Kate Fleetwood and Justin Salinger are simply, painfully fantastic as the warring couple. Their arguments manage a level of realism that is often lost in live performance due to the difficulty of maintaining true emotional intensity. 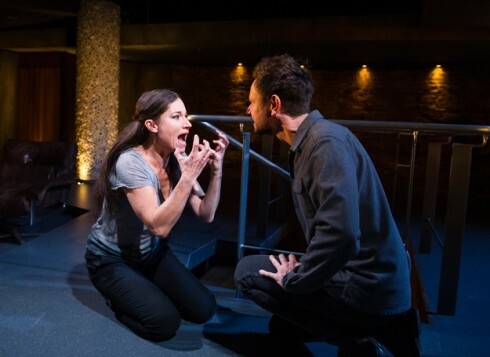 In real life these blistering arguments are incredibly messy, incoherent and illogical affairs, but in order to translate them to an audience it is quite usual for a playwright to split the dialogue into neat chunks and have coordinated plotting. This provides much greater clarity for the audience but it does distance the action and introduce a sense of unreality. Goold trusts Fleetwood and Salinger to manage this process, and it pay off in spades. Rather than go back and forth, the dialogue often overlaps, yet even in the heat of the moment – in the middle of a screaming match – it remains coherent and understandable. As a result it makes the audience feel they are watching real people with real passions rather than two dramatic constructs. Throughout Cusk’s handling of the play is subtle and regularly nods towards key points that can be lost due to a lack of knowledge of the ancient work. It is a cute touch to make Jason an actor. It is one of the few professions that can relate to the preening, mythic hero of the original Argonaut. He carries the infuriating presence of a man who has lead a charmed existence but who believes it has all been achieved by themselves. His lack of empathy is stunning, and can never imagine that what he feels is his reasonable nature is driven purely by a self-obsessed desire to keep the world the way he would want it. The version may primarily be about gender politics, but Cusk does not forget the importance of class within the original. Medea is essential a barbarian compared to the people of Corinth, and here this is nodded to by the excellent performances of Amanda Boxer and Andy de la Tour who are not listed as Medea’s parents but take on this role. 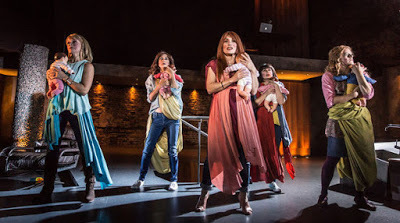 Equally the reason for the divide between the mums with their baby yoga and their nursery yard conversations and Medea is never explicitly stated. But then class never is. It is just clear that Medea is not one of them and the truth instead comes out in the conversational cracks – there is a wonderfully telling moment in the responses to the news that one of Medea’s boys has bit another child. Ultimately the notional sisterhood doesn’t extend very far beyond the preferred social group. 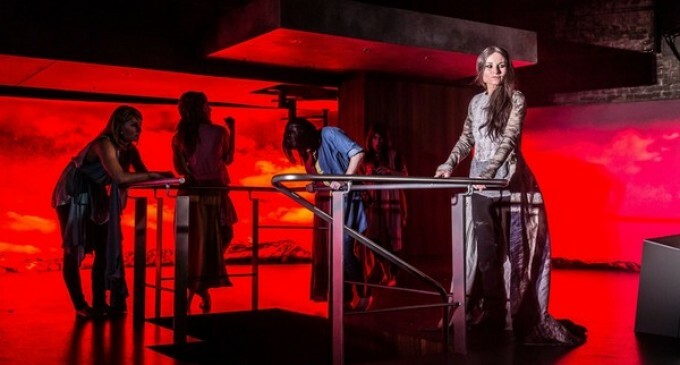 Yet for all these touches the play belongs, as it should, to Kate Fleetwood’s Medea. From the opening moments where she stands silent listening to the belittling critique from the Nurse/Mother, she dominates the stage and holds the attention. It is a stark, painful performance and the snarky comment that ‘she’s gone very Belsen’ is horribly apt. Her angular, jagged features seem to encapsulate the pain of someone who has seen 15 years of their life suddenly ripped away, and who sees their future disappearing with it. She walks the stage and engages her children with an emotional numbness that borders on the terrifying. Cusk refuses to make her entirely blameless, and her inability to engage with the process for the sake of the boys leaves the faintest impression of self-imposed martyrdom. Yet ultimately you want to root for her, and in Cusk’s reimagining the final tragedy is one that should have been foreseen but not one that Medea is explicitly responsible for. Cusk finds a way to rain vengeance upon Jason, punish Medea in the Euripedean manner but still make her in some way redeemable. It is an important distinction at the end of a very fine production.